This is a library of perfboard and single-sided PCB effect layouts for guitar and bass. I'm not an electrical engineer by any stretch of the imagination, just a DIY'er who likes drawing layouts. It is meant for the hobbyist (so commercial use of any of these layout is not allowed without permission) and as a way to give back to the online DIY community. I've gotten a few requests to redo the MI Audio Crunch Box with board mounted pots. How is that relevant to the Angry Charlie you ask? Well, it's the same circuit. JHS added a cap in parallel with the existing cap coming off the Presence control to ground which tames some of the highs. So if you want the Crunch Box, just leave that cap out. Yeah! This is very cool! Thanks man! You are the diyer evangelist! means adding a 100nF cap on crunch box will make it Angry Charlie. nice! I did it and it works better for me now. Maybe 100n is a bit too much bacause now i have to turn my tone at about 3 (hour) (i turn presence trim to 0 - no presence); the overall tone is nice and my crunch box V3 is more usable with my jmp 2203 low input. All tone pots are A10k, B100k for Vol/Gain. It's verified. I really, really like this version. I find the tone stack to be a lot more flexible than the Angry Charlie/Crunch Box. I just kept wanting a bass control. Plus this one lets you scoop mids and get a pseudo-metal sound. There's not a TON of volume in the pedal, but it gets above unity even at minimum gain settings. The clipping LEDs light up quite nicely so it's a good candidate for mounting them in the enclosure. one more to clarify, is that 2.2uF above the IC a ceramic or elco? I used a Tantalum cap there because I had it on hand. You can use that or an electro. Good morning. The only thing I do not understand is the mounting of the diodes ... I see that they are mounted in different verses, but what side of the diode is the cathode? Thank you. Joseph. The flat side of the LED indicates the cathode. In this case the cathode of D1 is on the right, the cathode of D2 is on the left. Thanks for the clarification. in the coming days I will build it and let you know how to sing. joseph. Man do I have the weirdest issue with this one and kinda stuck. I cn trace the signal amplified&all to pad 1 of the tone pot. Then it's just gone, it will not come through to the other pads..=). It's not the pot(checked and tried multiple), I've refloated everything and checked voltages all. After many etched boards, this is the weirdest...And most likely it's just something stupid I've missed. Still, this making my own pedals is an awesome way(most often) to quiet down my adhd brain so that I can sleep, thanks dude! Did you check for any shorts from pads 2-3 of the tone pot or pad 3 of the presence pot? My guess is something is shorting to ground and killing your signal. Oh yes, right you are. I stayed away for a day and looked at it again...And there it was, right under ny nose, how could I miss it eventhough I checked the board after etching...A tiny copper bridge straight to ground. Sounds like there's an issue with the volume pot. Is lug 1 connected to ground? Because you shouldn't have any volume when it's fully CCW. I'd check out DIYSB to see if anyone else has had a similar issue (check for threads on the MI Audio Crunch box since this is the same circuit). 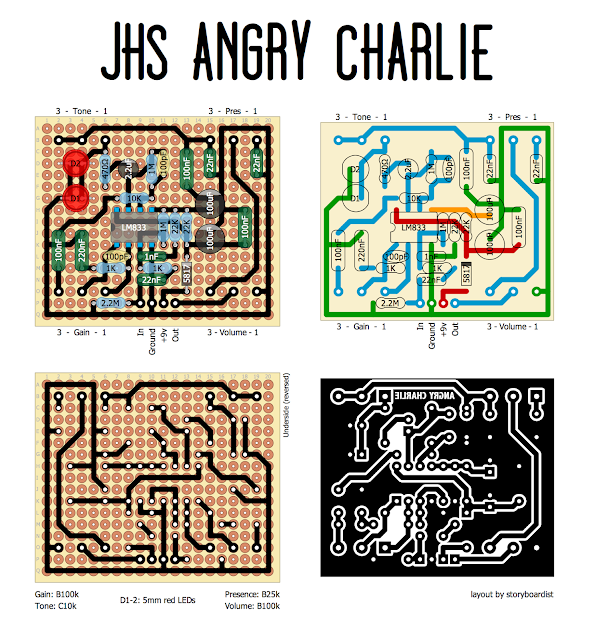 Hi, I have this one http://effectslayouts.blogspot.ca/2015/07/mi-audio-crunch-box.html how can I mod to JHS Angry Charlie? Add a 100nf cap from Presence 3 to ground. Hi, I have serious doubts the 0.1uF added cap is correct. 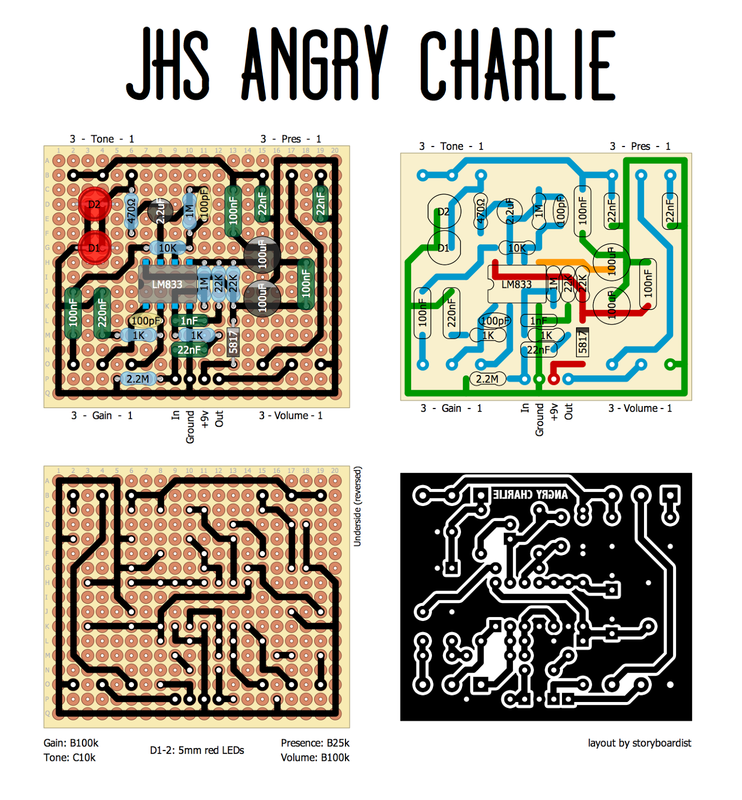 If you look at the Sweet Tea (a JHS double pedal which contains an Angry Charlie at one side), there is an SMD cap just on top of the IC, which must be the decoupling cap for the power supply of the IC. It is the only SMD component in that board and there are no 0.1uF caps close to the regular size 22nF tone caps. So I believe that "extra" 0.1 uF cap you see close to the opamp in the Angry Charlie guts pictures around the internet does only that: stability for the power supply of the IC. Unfortunately I didn't find any picture of a disassembled Angry Charlie to look at the other side of the board and confirm what I wrote, but I tried to add that cap in my clone pedal and that muffles the tone too much, compelling me to set the tone pots way too high to have an acceptable brightness. You are talking about a different 100 nano cap. The one from pres 3 to ground is right and works. with which tone pot could replace the C 10K since I can not get it anywhere, thanks! The Andy Timmons AT1 actually uses a linear ("B") 10k pot... So the Angry Charlie allegedly does the same, expect for the backwards wiring. By the way, I took off the C10k I used and put a B10k pot in my AT1 clone and it was a major improvement in terms of ease to adjust the treble. I increase or decrease the settings of the pots I have a variation on that noise. Is there a veroboard for this please? In this circuit the LEDs aren't necessarily meant to light up. They're being used a clipping diodes. So if it sounds good to you, don't worry about it. Hi what about putting another 22 n cap in parallel with the one from presence pin 1 to ground? That would essentially make for a 44n cap there. The LEDs are being used as clipping diodes, so they may not light up. It it sounds right, don't worry about it. I built this, but even with everything cranked all the way up on this pedal I can barely hear any sound. I have to turn my amp up super loud to be able to hear any sound coming through. The little bit of sound that is getting through sounds great, I just don't know why there is hardly any volume coming through. I have tried with multiple guitars and amps and get the same results. Any ideas on where I should start looking in the circuit for issues? I suggest going through it with an audio probe to figure out where things are going wrong. Hello and thanks for this great contribution, I have a problem with the pedal, the sound comes out approximately 10 seconds then the sound is reduced and nothing comes out, what problem could it be? For a moment I was wrong in the positive negative poles in the DC, but then I corrected it and I appreciate this problem. Olá boa tarde, como esse layout eu consigo montar um angry Charlie AT? Hi, I did it and it works perfect, what I would like to change is the presence as it gets very serious when moving in a clockwise direction. Will I have to change one of the two 22n? which of the two? Which of the 100nf caps I have to leave out to make the crunch box? The one next to the two 100uf or the one next to the 22nf? The one next to the 22nF. Can I use an Lm4558? Yeah, any dual opamp should work. If I use 3mm led instead of 5mm? I think it's OK right? Yeah, not all LEDs have the same forward voltage. Green LEDs will still clip, they'll just clipping differently than reds. I built it, very good but don't you think that the volume is too high already from 7 o'clock, and the tone control cuts the high frequencies too much? Has anyone had problems with the tone pot? I always have to keep it at the max to get decent high freq. Having trouble scaling a PCB transfer image? Check out the Transfer Image Library page for pre-scaled PDFs of every PCB transfer image on the site. All you have to do is download the file and print. The files are organized by brand. Those brands that do not have two or more layouts on the site are grouped together in the "Misc." folder. Copyright © 2016 All rights reserved.. Simple theme. Powered by Blogger.